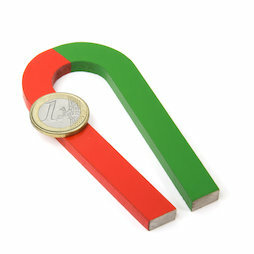 This bent AlNiCo horseshoe magnet is 100 mm x 48 mm big (at the widest spot) and red-green coated. The north pole is located on the red end. The horseshoe magnet is well packaged for shipping, the poles are short-circuited with a magnet keeper. 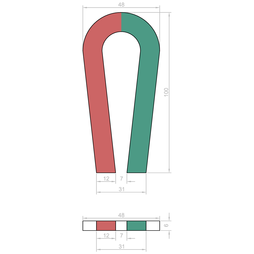 As opposed to our other three horseshoe magnets, the arms of this magnet are not parallel and the ends of the poles are closer together.